For most enterprises, the question is no longer whether to pursue a hybrid cloud storage strategy to diversify their storage infrastructure. The question is now how to best implement that strategy. 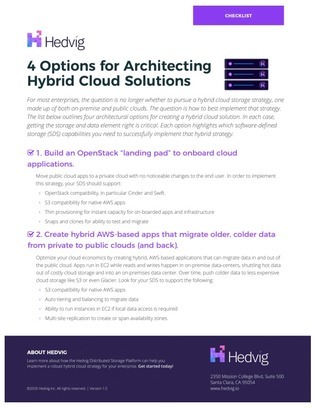 The checklist included in this resource outlines four architectural options for establishing hybrid cloud storage in your organization. Each option also highlights which software-defined storage capabilities you’ll need to successfully implement that hybrid strategy. Read on to view them.